Welcome to Varal WAMP, the complete WAMP solution. Varal WAMP allows you to develop and host websites on your PC with great ease. Whether you are a web designer or a advanced web developer, Varal WAMP has been developed keeping you in mind. 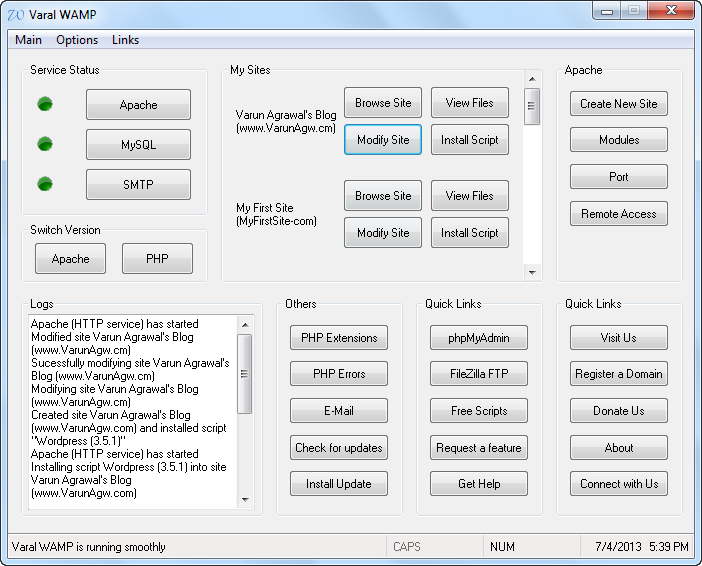 The current version of Varal WAMP is build with latest configuration. The latest version includes Apache 2.4.4, PHP 5.5.0, MySQL 5.6.10 as well as phpMyAdmin 4.0.4, xDebug 2.2.3, FileZilla FTP 3.7.1, WordPress 3.5.1 and lots of add ons. Its powerful yet user friendly interference ensures you can focus on development rather than spending hours configuring the server. To get Varal WAMP click here.